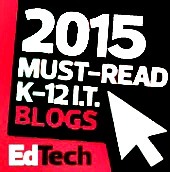 The 2010 Edublog Awards – Nominations Open! Always cutting edge, compassionate, and savvy - Shelley Terrel is a true web wonder! Honest, fearless, and willing to share both triumphs and failures on her new blog, Sara Kelley-Mudie is an inspiration! She's also been named one of AASL's Emerging New Leaders Program! And she's funny. 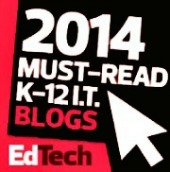 Best Resource sharing blog: Richard Byrne - Free Technology for Teachers - Always a great source for new information & resources! Most influential blog post: Danah Boyd - "Bullying" Has Little Resonance with Teenagers Danah writes with such insight and passion - and this topic is very important to me - she always makes me think! Best teacher blog: John T. Spencer - Spencer's Scratchpad - Candid, creative, and curious - Mr. Spencer shares his triumphs and failures with us all. Best librarian / library blog: Buffy J. Hamilton - The Unquiet Librarian Buffy is a cutting edge librarian and a fearless change agent...through her we learn so much and can implement innovations within our library practice. Doug is a great administrator, leader, and blogger. I was torn to put this under lifetime achievement but the fact that Doug is an admin position in a real school district shows just how amazing it is to have his thoughts, beliefs, and advocacy on our side! Go Doug! He's also a super nice, down to earth, and funny guy. 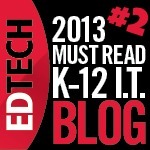 Best educational tech support blog: Larry Ferlazzo - Generous and super nice (he actually DM's thank you for RT's & mentions! 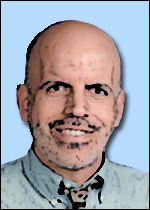 ), Larry is an amazing educator who shares without hesitation and with great finesse! I find his "Best of" lists always useful & spot on! 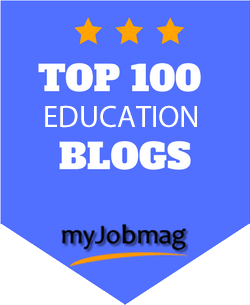 Best elearning / corporate education blog: Adam Bellow - EduTecher - Cool, charitable, savvy, and smart this blog is clean and simple to use chock full of great stuff - and no ads or hard sell! Best educational use of video / visual - Robert Ahdoot - YAY Math! 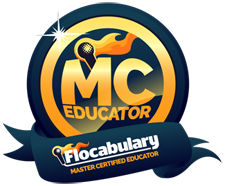 - I blogged about this site last week...amazingly approachable Math videos that make learning FUN! Best educational wiki - Joyce Valenza/New Tools Workshop -What can I say? This wiki - and many of of Joyce's wikis, are chock full of amazing information! Best educational webinar series -The TL Virtual Cafe - I admit to being a little biased as I help out with this venture, but this is an amazing virtual place brings FREE professional development every month with some of the most amazing guests into your living room! 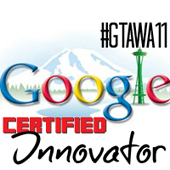 Best use of a PLN - Alec Couros/@courosa - He's cool. Best educational use of a social network: Joquetta Johnson - The Digital Diva- Energetic and exciting - Joquetta brings it all together from blogs, tweets, nings, to amazingly inspirational sessions and presentations that make you want to jump up and drink whatever koolaid she's serving. Yeah, she's that good. Best use of a PLN: Diane Cordell - Journeys and Twitter dmcordell and Flickr - Diane Cordell brings us all together...she's a creative & talented PLN building force of nature! 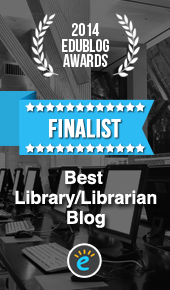 Lifetime achievement: Joyce Valenza - The NeverEnding Search Blog - If I was on a desert island and could only read one blog to learn about the latest thought, tools, & resources in the Ed Tech Landscape (and NOT JUST LIBRARIES!) Joyce Valenza's NeverEnding Search blog would be it! How do I Do it? Pay it Forward! Thank you all the wonderful educators who take the time to share, retweet, recognize, and revolutionize our world of learning practice! Without you, the change agent, we would not be inspired to carry on, create, collaborate, and to connect with each other. YAY you! Last year I was incredibly gobsmacked & flattered when Shelley Terrell (Shelly Terrell: Global Netweaver, Curator, PLN Builder By Howard Rheingold ) nominated me for an EduBlog award. (whatthewhat!?!) Since then, my PLN has grown even larger and more vibrant as I've met & connected (virtually & F2F) with so many wonderful educators (like you!) who have likewise enriched my practice! I'm still black and blue from pinching myself over the great things that have happened in the last year - and blogging, Twitter, graphic design, & wikibuilding have given me a greater passion to SHARE! Share! and Share some more! 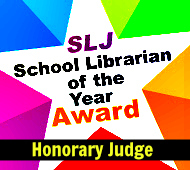 And of course, I would be more than happy to be nominated in one or two categories myself if you feel that the Daring Librarian blog, the Daring MHMS School Library blog or my Tweets have added value to the development of education practice . Thank you! Thank you Gwyneth! I love the company - virtual and real life - that I keep. What a great group of nominations. I'm honored to be included! Thanks. Thank you for the lovely nomination for the ISTE SIGMS build in Second Life. Lisa Perez and you gave me the opportunity to indulge in creativity & fun-a great way to end the school year! 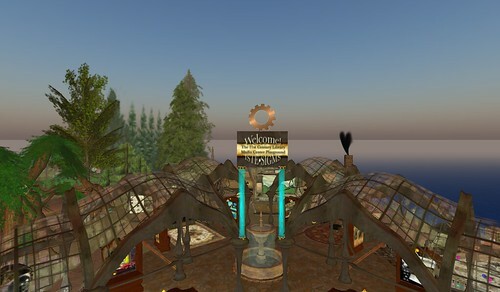 Thank you for the lovely nomination for the ISTE SIGMS build in Second Life. It was great to collaborate with Lisa Perez and you for this creative & fun project. See you in February! WOW thank you everyone! I'm so honored to have you all in my PLN! Diane, There is no Geek Tribe without you, twinnie! Larry, you're a gent...a brilliant, gent! Linda, (dear Eleanor) I may have thrown a few pieces of furniture around but YOU are a master virtual Second Life builder! Shelly, your support and encouragement has been pivotal to my career...Thank you!